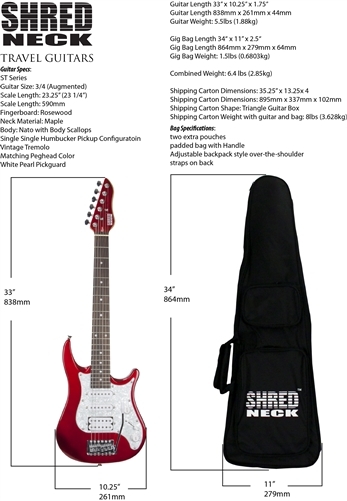 The Shredneck Travel Guitar - Model STVX-MBL - Mystic Blue Finish with matching color peghead is a 3/4 scale guitar featuring a modified ST body shape with body scallops on the treble and bass body horns. 22 Frets on a Rosewood dot fingerboard with matching color peghead. The bridge is a traditional style tremolo with a SSH (single, single, humbucker) pickup configuration. Features a master Volume and Tone control and 5 way selector switch.